A mural by street artist Banksy showing two children playing with a "no ball games" sign has been cut out of a wall in Tottenham, north London. The graffiti, which appeared on the side of a shop at the junction of Tottenham High Road and Philip Lane in 2009, is to be sold for charity. Janet Cooke, who works nearby, said an "iconic bit of Tottenham" had gone. The firm managing the sale - the Sincura Group - said it had not been appreciated in situ. Events company Sincura Group also put the Banksy mural Slave Labour up for auction in June. The artwork, showing a boy making union jack bunting on a sewing machine, was taken from a wall in Wood Green, north London, in February. It had been sprayed on to the side of a discount store just before the Diamond Jubilee celebrations in 2012. The group's director Tony Baxter said he had been approached and asked if he could manage the sale of No Ball Games. He declined to say who approached him. He said the piece, one of Banksy's largest, had to be removed in three pieces. The last section featuring a girl will be removed later, he said. He said the artwork had been defaced a number of times and people's view of it had been spoilt by renovation work in the area and a "pylon" being placed in front of it with a security camera. He said it would be restored over six months before being auctioned in spring next year with profits going to charity. He added: "It's a beautiful piece." Mrs Cooke, of Cooke Estates, said she saw workers plastering both sides of the wall on Thursday. "Everybody knew it around here and went to have a look at it. It was a little iconic bit of Tottenham," she said. "Now it's going to be famous for being a place where a Banksy was once." Councillor Alan Strickland of Haringey Council said he was "very disappointed" that a "community landmark" had been removed. Haringey Trades Council secretary Keith Flett said: "The Banksy was an important cultural feature of the area and if it has been removed it will be another indication that local people's wishes come second to the interests of profit." Video Who owns Banksy's Slave Labour? 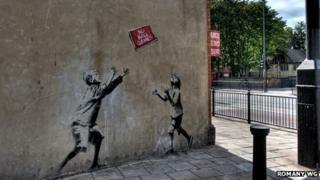 Audio Should 'missing' Banksy work be sold?